Is crafting the perfect distraction? This weekend in my Weight Watchers meeting the topic was finding distractions in place of emotional eating. The ideal distraction is quick and enjoyable while keeping your mind and hands busy. 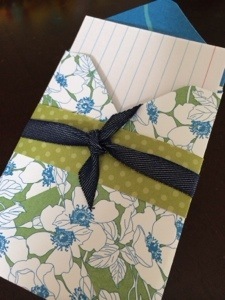 Of course, I immediately thought of crafting and while someone else mentioned scrapbooking, we had a discussion on how it needed to be quick, not that you have to take all kinds of stuff out and begin a huge project. Just like going to the gym is too big of a process (how many peanut butter cups can one eat in the time it takes to change your clothes, drive to the gym…) Meanwhile going outside and taking a walk around the block is a realistic response. 2) Create a list of quick projects that I can create. This is my first project. It’s holding index cards that I can use for these lists or other journaling. This entry was posted in Uncategorized on February 17, 2014 by katzcreates.